Each and every one of us tends to know the interpretations of a dream, after having a beautiful vision or an awful nightmare. Only then, we long to understand the hidden meanings behind them and a lot of these interpretations help us to dig into our inner selves, looking for more answers. Of course, there are professionals for this kind of job and there are several scholars who explored this field, such as “Ibn Serin” the Islamic scientist who elaborated that our dreams have meanings and that they can tell us more facts about our lives. Not only dreams can be interpreted, but also one’s own drawings or scribbles. It is not officially used by Psychologists, but it is, indeed, very descriptive as it can add more information to their analysis. So, basically exploring your personality or analyzing one’s absent-minded scribbles is known as drawing "Doodles." “Doodles are expressions of the subconscious mind.” This quote sums up the idea of doodling which is the process that usually occurs when you're not alert. Whenever you are on the phone, daydreaming or feeling stressed, you begin to draw little sketches, hearts or irregular lines and this process evolves when you are in a stage of extreme boredom or rage. Doodling can really help you to get rid of the confusion that irritates you every now and then. “We allow ourselves to express the ideas that are locked in our head[s].” It helps in revealing our moods and mental reactions as it has became so much hard for us to understand ourselves nowadays. Those doodles have different interpretations due to the variety of drawings. 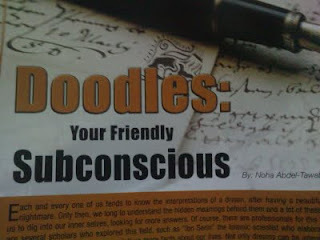 For example, you may draw lots of stars which indicate that you're romantic or you may shade some bars which tell how you have a sense of suffocation as Anna Koren explained in her article “Doodles.” Each drawing has a unique symbol and a meaning that's because we're all different of course. Doodles can clearly show your various moods, and also can explain if you have some kind of problem or even if you are planning for some visions, hoping that they may come true some day. Doodling is a creative process that has several sizes and different shapes. Each figure has its own symbol that expresses the characteristics of a person, and at the same time it “can carry a great deal of meaning.” When you start to doodle, you draw anything that initially comes to your mind. Your first impulse pushes you to set your ideas free. It is shown clearly when the size of your doodles is quite big as it explains how important it resembles. On the other hand, little-sized doodles show how much you may feel the sense of entrapment and loneliness. Various shapes of doodles help in exploring your way of thinking. The main types are shaped like Stars, Flowers, Eyes, Bars, Repetitive & Geometrical shapes, Faces, Animals, Arrows, Zigzags, Webs, Hearts, Oceans, Trees and Signatures. I sometimes tend to draw lots of Bars, Webs and Flowers myself. And according to Anna Koren’s article “Doodles,” Bars indicate the sense of suffocation, a need to escape, a desire for freedom and a feeling of restricted actions. While Webs are shown as symbols of entrapment and serious dilemma in the article entitled “Doodle Analysis.” As for Flowers, Helen South has an interesting interpretation of them telling how they show the sense of gentleness in a person, his friendly and childish nature, and adds that if these Flowers have “sharp thorns, [they would] indicate betrayal of love.” As the articles continue elaborating; Stars indicate romanticism, Eyes are a sign of constant observation, Repetitive shapes resemble patience and perseverance, Arrows reveal ambition, Hearts symbolize sentimentalists, and last but not least Signatures draw someone’s attention to an identity problem. Moreover, the pressure of the used ink of your pen and your doodling positions are of a great importance to your analysis. To explain the importance of your doodles’ position in a paper, we have to bear in mind that you may have different moods at different times, which means that this position depends on what you're feeling at that exact moment. Mainly, there are five positions; Center, Top, Bottom, Left and Right. According to Helen South, doodles drawn at the center of a page “suggest a self-centered, attention-seeking extrovert,” while the ones at the top indicate enthusiasm and spirituality, and others at the bottom shows your critical and practical approach in addition to timely depression. Helen south, also, explains how people rarely doodle on the right side, as it is the usually allowed space for writing. While Anna Koren sums up the interpretation of the left side by informing us that, whoever tends to doodle in that particular position, he/she may be held by the past, apprehensive and usually have fears of being exposed to new people and new lives. Usually when you draw your doodles, you may not concentrate very well in what you're doing. So, after finishing, you should start analyzing them by any means in order to understand the hidden thoughts behind them. One of these means is indicating the pressure of ink drawn on paper. In Anna Koren’s article “Doodles,” she divides this pressure into 4 types; Heavy, Medium, Light and Irregular. First, the Heavy type expresses aggression and activity, while secondly the Medium type “points to a well-balanced personality. Thirdly, the Light type indicates sensitivity, and lastly the Irregular type resembles impatience, restlessness and lack of stability. Doodles often indicate several interpretations and are considered as a fun way of discovering the inner feelings of someone and rather easy for an individual to use. You may be mysterious and kind at the same time, or sometimes calm and aggressive as well. Analyzing Doodles is one of the most interesting ways of detecting your good and bad aspects as it could help you to develop yourself and most importantly be friends with it. Maybe a lot may not see the importance of such process, but I personally think that it could discover many riddles in someone’s character. So, pay more attention every once in a while to what you're doodling. You definitely could use some interpretations about yourself in the easiest way you could have ever imagined. Thx a lot Karim ..